Sidewalk Slip and Falls in Wisconsin | Hupy and Abraham, S.C. The short answer is maybe, but more information is needed to help you determine whether you have a claim worth pursuing. If you have been seriously injured in a slip and fall accident, then you should review the information provided below and start a free live chat with an experienced fall injury lawyer today. Was There Snow and Ice? Many falls occur when there is snow or ice covering the sidewalk. While the municipality may own the sidewalk, many city ordinances make snow and ice removal the responsibility of the person who owns the land immediately abutting the sidewalk. For example, in Milwaukee property owners are required to remove snow and ice from the sidewalks next to their properties within 24 hours after snow stops falling from the sky. In Madison, property owners have until noon the day after the snow stops to clear their sidewalks or take other measures to create safe sidewalks for pedestrians. 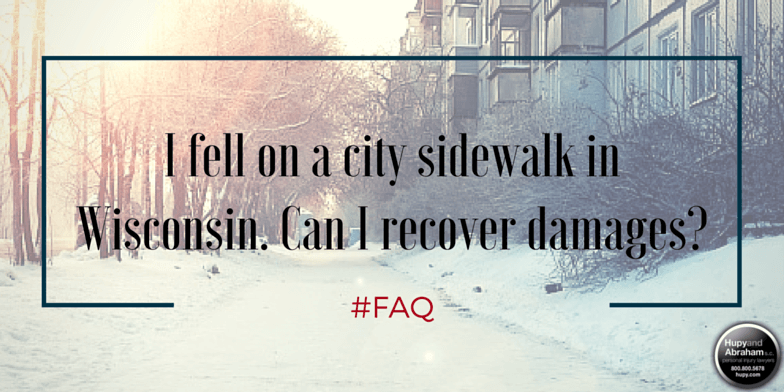 Despite these ordinances—and others like them around the state of Wisconsin—it can be difficult to recover damages from a property owner after a slip or fall on an icy or snowy sidewalk. If you are going to pursue a case, then it is important to take photographs immediately following your fall, to see if there were any witnesses to your fall who can testify about the condition of the sidewalk, and to see if the property owner had a history of failing to adequately clear the sidewalk of snow and ice. Typically, fall victims can recover if they can prove that the snow or ice was an artificial condition rather than the natural accumulation of snow and ice and that the property owner was negligent. What If There Was No Snow or Ice? In the absence of snow and ice, it is usually the city or town that is responsible for maintaining the sidewalk. If the city or town had knowledge of a broken or defective sidewalk, then you may have a successful claim for your fall injuries. However, it is important to remember that the time frame for providing notice to a city, town, or other government entity is short and that you need to take action quickly. To learn more, please call us directly at 1-800-800-5678 for your own free, no-obligation consultation.